Progressives across Texas appear to be uninspired by the candidacy of Lupe Valdez, the Democrat looking to unseat incumbent Republican Gov. Greg Abbott in November. Valdez, the daughter of migrant workers and the first openly gay individual nominated by a major party for governor of Texas, has come under fire for her ambiguity on illegal immigration and other issues important to liberal activists and groups, the New York Times reported Monday. Much of the progressive criticism of Valdez concerns her tenure as sheriff of Dallas County, Texas. Under Valdez, the sheriff's office cooperated with U.S. Immigration and Customs Enforcement (ICE) to detain and deport illegal immigrants. The Dallas County sheriff's office continued these practices until 2015, when Valdez announced, after facing pressure from local officials and activists, that illegal immigrants arrested for minor offenses would not be held for an additional 48 hours for ICE. Valdez's actions came shortly before several former inmates of the Dallas County jail filed suit against her and the county, claiming their constitutional rights were violated after the sheriff's office refused to release them at the request of immigration officials, even after a bond had been posted for their release. Activists have also castigated Valdez's oversight of the Dallas County jail, which the U.S. Department of Justice has routinely accused of mismanagement and civil-rights violations. In 2015, the jail garnered media scrutiny after video footage revealed a man died after an altercation with sheriff's deputies. Valdez's tenure as sheriff and her unwillingness to discuss immigration issues openly on the campaign trail have fueled criticism of her candidacy. Ginny Goldman, a top Texas political strategist, told the Times that Valdez had a long way to go before she could credibly expect progressives to show up for her in November. "People want real change in their lives, they want someone who's going to fight and deliver for them—and just having a ‘D' next to your name isn't enough," Goldman said. "[Valdez] has a lot more she needs to do to in order to reflect the new energy and new politics that this state is moving toward." In response to the criticism of her record on immigration issues, Valdez has touted her long-held opposition to Senate Bill 4. The legislation, which banned sanctuary cities and made it a misdemeanor for local government officials and employees of public higher education institutions to refuse to work with ICE to enforce federal immigration laws, has become a rallying call for liberals across Texas. Valdez has also attempted to play down her role in the deportation debate. In April, while speaking to Jolt, an organization consisting of young Hispanic activists, Valdez said she only "complied with detainers" not to risk justice system funding essential to rehabilitative programs. "While I was sheriff of Dallas County, I complied with detainers or else we could have risked funding for a range of resources, including drug courts, juvenile justice programs, and body cameras," Valdez said. "I didn't have the ability to change federal or state policy and Governor Abbott got his way." Jolt's membership did not seem to buy the explanation, as the group opted to endorse Andrew White, Valdez's main opponent in the Democratic primary and the son of a former Texas governor. Much of the Democratic Party's lack of enthusiasm for Valdez does not bode well for her in November as she lacks statewide name recognition and trails the incumbent in fundraising. The most recent campaign finance disclosures showed that Valdez raised $291,000 in the first quarter of 2018 and had $258,00 cash on hand, paling in comparison to the $41-million war chest Abbott has amassed, according to the Texas Tribune. Likewise, Valdez has spent little on traditional and digital media advertisements to bolster her campaign. The Washington Free Beacon recently reported that Valdez has yet to run any Facebook advertisements, an increasingly prolific medium for candidates to engage with likely voters and amplify their message. Compounding the problems for the Democratic nominee is the fact that many political observers view her as a policy lightweight. 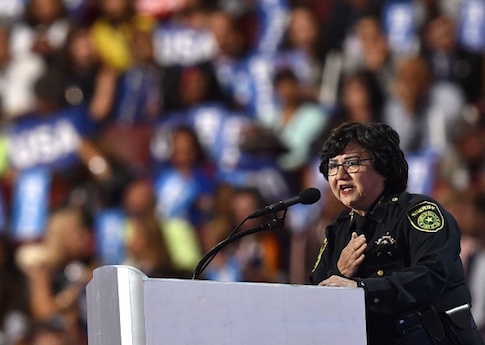 In the midst of the primary campaign, Valdez's hometown newspaper, the Dallas Morning News, lambasted the former sheriff for her "gross unfamiliarity" with the issues facing Texas. The papers also cited Valdez's "incoherent" attempts to "discuss state financing" as an impetus for endorsing her opponent in the Democratic primary. Valdez has also had trouble solidifying support from the LGBT community. In February, the oldest LGBT advocacy organization in the South, the Houston GLBT Political Caucus, snubbed Valdez to endorse White, her heterosexual primary opponent. The snub stung all the more considering White had recently resigned from a position of leadership, which he had held for years, in a church that supported traditional marriage and denounced homosexuality as a sin. In explaining its endorsement, the caucus lauded White as someone who "would do a better job in fighting back" against actions targeting the LGBT community in Texas. The organization also said that in its meetings with Valdez, the candidate "did not reassure" that she "would be able to" stand up for the LGBT community or possessed the "knowledge" and understanding of how the governor's office operated "to do so." The problem for Valdez seems to be that while she fits the mold of where the modern Democratic Party is headed, that is not enough for progressives to forgive her previous actions and political stances. This sentiment was echoed by Rev. Jefferey Hood, a pastor and progressive activist, who told the Times that he would not support Valdez simply because she checked off the right demographic boxes. "Just because she's lesbian doesn't mean she's progressive, and just because she's Latina doesn't mean she's progressive," Hood said. This entry was posted in Politics and tagged 2018 Election, Democratic Party, Governor, Greg Abbott, ICE, Illegal Immigration, Lupe Valdez, Progressive Movement, Texas. Bookmark the permalink.